Have you been at the point where you thinkWHAT MORE CAN I DO? You’ve worked hard, you’ve shown up, and well, things just aren’t the way you would like them to be. You’re frustrated and at your wits’ end. Rotary can be like that sometimes. We get tired. We feel like it’s taking too much of our time and not enough of someone else’s time. We organize, we work, we donate, and we feel a little disappointed that others don’t share our passion. The district governor attends one of our club meetings a year and tells us we need to grow our membership. Easy for her to say, she doesn’t have to do it. You leave the meeting and you think, maybe with a shrug of your shoulders and more than a little sigh, what more can I do? If it makes you feel any better, you’re not alone. We’ve all heard attitude is everything. Remember the question about the glass of water—half full or half empty? In this year of Be the Inspiration, I ask each of you to do me a favor. 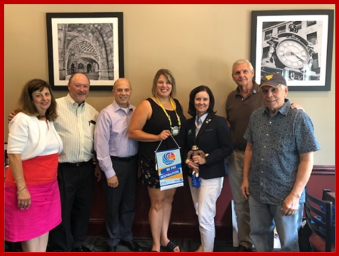 Last year, while I was training for the district governor’s role, I attended a Zone Institute in Chicago. Membership Co-Chair Sara Fenimore and I sat in a dark, cold auditorium and listened to John O’Leary, who as a child had been burned over 97% of his body. Shortly after the fire, John asked his mother, “Am I going to live?” She told him that it was up to him. John chose life and asks himself every day What more can I do? DREAM TEAM—WHAT MORE CAN WE DO? Together, we see a world where people unite and take action to create lasting change — across the globe, in our communities, and in ourselves. Whether we are raising money to fund good works or building membership, let us face our challenges with a fresh approach. 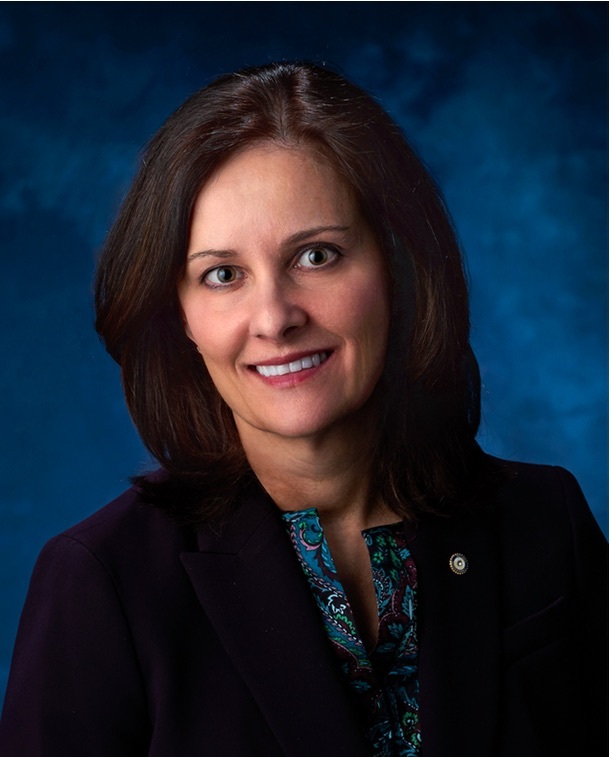 The way we ask the question What more can I do?is much like our Rotary story. We believe in Service Above Self. Funny how that works though--at some point we realize Rotary’s greatest impact has been on ourselves. 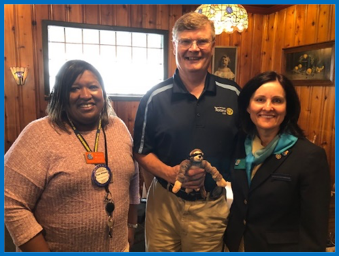 Flying monkeys were spotted in Mount Pleasant by President Doug Hauser and AG Toni Wilson. 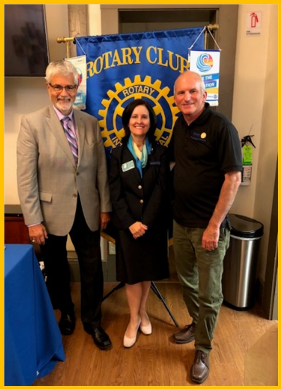 President Mike Milinovich of the Rotary Club of Waynesburg welcomed AG Brad Montgomery and DG Cherie. the meeting at Connellsville in President Justin Teets absence. 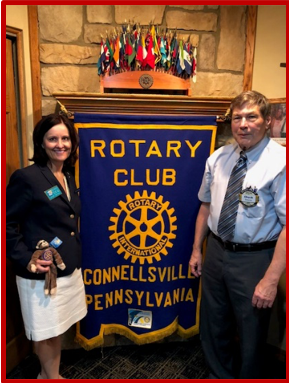 Roty and DG Cherie enjoyed their visit with the Rotary Club of Monessen-Rostraver and learned more about the Zombie Run. 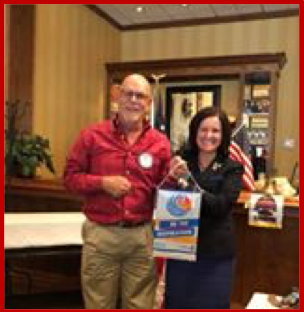 McMurray President Woody Lutz received a Be the Inspiration theme banner from DG Cherie. 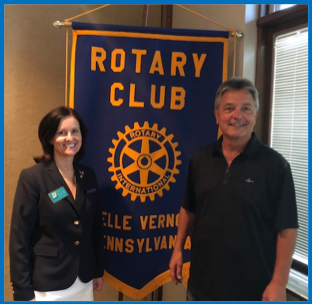 Belle Vernon President Larry Golaskewski shared plans for the Car Show held by the club on August 5th. 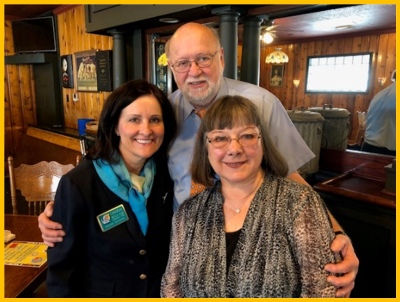 DG Cherie is inspired by PDGs Colleen and George Wood while visiting the Mt. Pleasant Rotary. 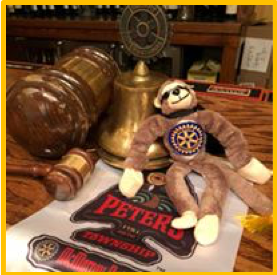 Roty thoroughly enjoyed the warm welcome he received from the Rotary Club of McMurray!